Before we get to the interview we must fast forward one day past our first sit-down when I catch up with Joseph Parker, stable mate Izu Ugonoh and trainer Kevin Barry to watch as Tyson Fury dethrones Wladimir Klitschko and assume the mantle as the king of the heavyweight division. Both Parker and Ugonoh had been part of a recent training camp with Klitschko and there had also been some talk of Joseph Parker joining Fury’s camp for this fight. A scheduling conflict meant Parker couldn’t make it, which may well work in his favour should he have to cross paths with Fury in the future. It’s an interesting exercise to sit with professional fighters as they watch the work of their contemporaries and possible future opponents. Interestingly before the fight neither Kevin Barry nor Joseph or Izu were prepared to dismiss Fury’s chances out of hand, the general consensus being that he was very much a live underdog going into the contest. There is also a sense sitting around the table as we watch the fight unfold that, it’s upsets like these that provide the fuel for young up-and-coming fighters to put in that extra work as they attempt to emulate the same feat that Tyson Fury has just accomplished. It also makes a little more sense as to why the 6,7” Daniel Martz has been chosen as Parker’s next opponent, with trainer Kevin Barry being very vocal about starting to put his fighter in with bigger and bigger men as Parker begins his preparation for facing larger obstacles like Tyson Fury in earnest. ESB: Daniel Martz he’s a big guy? Joseph: Yeah, he’ll be the tallest I’ve ever faced. I’ve studied him on YouTube, he’s definitely a decent sized guy to go up against. ESB: I know in taking the Kali Meehan fight you liked the size of Meehan and also wanted to face someone experienced. With Martz, apart from his size and height what else attracted your team to him as an opponent? Joseph: That’s right we liked the size and experience of Meehan but when I got in the ring with him I felt he perhaps didn’t use that experience to his full advantage, he didn’t keep me at bay, he allowed me to come in on him. I think with Martz he looks like the kind of guy that can control the distance and that when I do get inside he will use his body and size to tire me out and tie me up. I’m looking for that type of specific challenge. Punching upward is a lot different to punching straight on or even downwards. Even on the heavy bag Kevin has put some tape up high on the bag to aim at. This is a crucial part of my development. ESB: From a technical standpoint, not Martz specifically, but more in general terms and thinking about potential future opponents like Fury, Wilder or Joshua, what are the basics for successfully fighting a bigger opponent? Joseph: These guys are all massive, so for me everything starts off with the jab. The jab moves you in to position to throw combinations. Even if you are the smaller guy if you time the jab right you can land it, just like Mike Tyson used to. With a bigger guy Kevin has taught me how to ‘step in’ with the jab more, controlling the distance by using angles. ESB: I know due to existing commitments you couldn’t make the camp with Tyson Fury but I guess that would have been a unique opportunity to work with a much taller guy? Joseph: It would have been one of the best experiences not just sparring with a taller guy, but a guy already at the top level and he does have a really good jab as well. We tried our very best to see if we could fit it in to the schedule but in the end we couldn’t quite make it work. We were honoured that they could see us as someone that could help them. ESB: Having had a chance to develop for over 2 years now with Kevin Barry what do you personally regard as your strengths as a fighter. If you were fighting you, what would you be wary if? Joseph: My speed and now my movement. I like to use the ring, use my legs. I’ve spent a lot of time conditioning them for that reason. And I throw a lot of punches, a lot of combinations. I remember Kevin saying if you ever lose because someone is better than you then that is fair enough, but if you lose because someone is better conditioned than you, then you haven’t worked hard enough. ESB: I know in some fights there have been times when you’ve had to fight moving backwards. I know Kevin likes you to be on the front foot as often as possible, but it’s not a bad ability to possess as there are going to be periods in tough fights where you don’t have it all your own way. Joseph: Yeah of course. In most fights you will plan on coming forward and applying pressure but like you say there will be moments in a round where the opponent has that front foot advantage and you have to be prepared to be able to fight going backwards. I haven’t had to fight backwards a lot but I am comfortable when I have had to. ESB: And you’re also developing an inside game as well. I’m sure a lot of your future opponents, some of those bigger guys will be looking to lie on you, maul you, tie you up. So that will be important skill to possess? Joseph: Fighting from the outside is what we like to do, but developing our inside game is going to be a big part of the strategy going forward. Some guys love to fight the inside game and we must be prepared for that type of fighter. ESB: I know you also received a last minute offer to fight on the Canelo/Cotto undercard but you had to turn that down as well? ESB: We are now very much in an instant gratification generation where some fans expect you to fight for a title tomorrow, but when comparing your career so far to a past Kiwi favourite David Tua, although you are very different fighters, I checked and his 17th opponent was Cecil Coffee. So all things being equal a guy like Daniel Martz is the right opponent at this point in your career still being so young? Joseph: It’s not easy trying to build a career. You have to put a structure and a plan in place. It’s a marathon not a sprint. Us as the fighters we have to train hard and fight obviously but behind the scenes there is a lot more going on, we have a whole team working away and a lot to deal with. So yes we’re very happy with where we are at right now. ESB: And quite often the public doesn’t understand that for every opponent that you face there is often a dozen or so names that have already turned you down? Joseph: Correct, we have offered a lot of fights to many of the top fighters and they have turned us down. But we prefer not to name names; we just keep it in the background and concentrate on what we’re trying to do. ESB: I know you are concentrating on this fight but it is no secret that you do have another fight scheduled in your parents home country of Samoa in January, pretty much straight after this one. How long has that been in the pipeline and what does it mean to you to be fighting over there? Joseph: We’ve talked about it for around a year and a half and the reason we wanted to do it is because Samoa has produced a lot of great fighters, in fact a lot of great athletes, and when the All Blacks (New Zealand’s national rugby team) went over to Samoa the whole country got behind it so we saw it as an opportunity to take boxing over there as well. ESB: This is being fought at a time of the year when you could theoretically be sitting on a beach eating some slightly bad food and enjoying the fruits of your labour? Joseph: I’m actually excited just to be fighting in Samoa as everyone is all excited and preparing for it. It will be great for the country and I’m excited to give people the opportunity to see me fight there. Indeed it promises to be a great event for a small island country starved of international sport, reduced to viewing it through the looking glass of TV. However before Parker can concentrate on his January assignment he must first get past the large proposition that is Daniel Martz. Expect Parker to work his way in through his trademark jab and target Martz’s long torso. Martz has also shown vulnerability to a big right hand, a fact that will not have escaped either Joseph Parker or his trainer Kevin Barry. On paper this is a fight that the young prospect should be able to close out in the early rounds but having just sat with Parker and watched Tyson Fury upset the apple cart in Germany you’re always reminded that in boxing and with heavyweights in particular anything can happen and oftentimes it does. 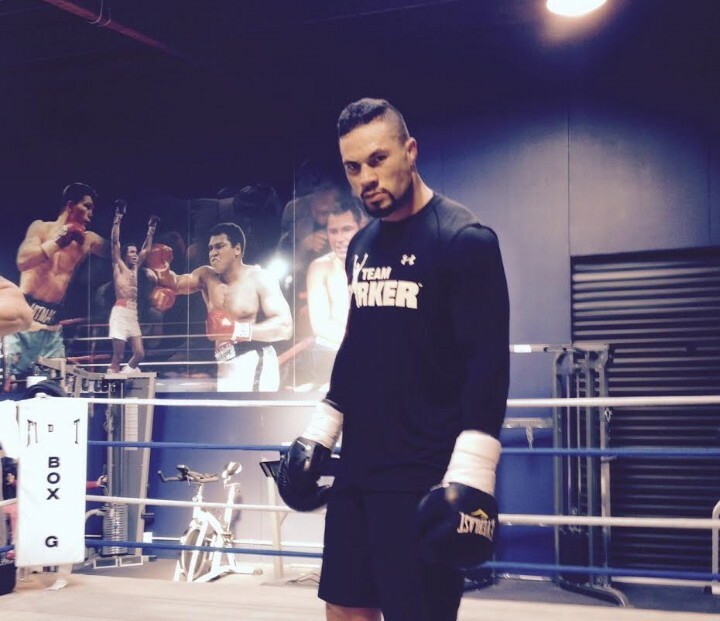 Joseph Parker 16(14)-0 faces Daniel Martz 14(11)-2-1 at Claudelands Arena, Hamilton on December 5th.